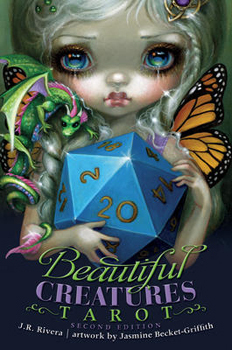 In this revised and updated version of Beautiful Creatures Tarot, visit a mystical and exotic world where all your questions, big or small, complex or simple, are answered with the utmost love, honestly, and clarity. Enjoy 80 beautiful and now gilded Tarot cards (including 2 extra Wild cards and 4 brand-new images) depicting mythical and legendary creatures as they guide you to a place where all problems are left far behind, and faith and positive energy in life are restored. Interspersed new commentary and a new astrological game to play with the cards enhances the attraction to the child-like creatures that are playful, serious, and friendly, and who will aid you in discovering the answers you have been seeking. Connect to diverse messages in the now full-color companion guide that includes six new spreads. Don't shy away from these beautiful creatures; come into their world and lose yourself within their authenticity.